Uluru is a standout Australian landmark, recognised all around the world. But how much do you know about it? What is Uluru? We explore its geological history, the Aboriginal perspective and a personal outlook on how it affected us. First, the geology. Uluru came into being around 500 million years ago. At the time, two huge chunks of landmasses were pushing into each other. The land pushed up and folded, forming the Petermann Ranges. If this name seems familiar, the Petermann Ranges are east of Docker River. Now these ranges were seriously big. We’re talking similar heights as the Himalayas are now. But there was a problem. Plant life on land hadn’t been invented yet, so the mountains rapidly eroded. Zillions of chunks of granite were broken down into feldspar and quartz, washed off the mountain and deposited at its base. Then an inland sea covered this region. Layers of sediment were deposited on top of the loose deposits, compressing it and forming a type of sandstone, deep underground. About 400 million years ago, more mountains were formed. 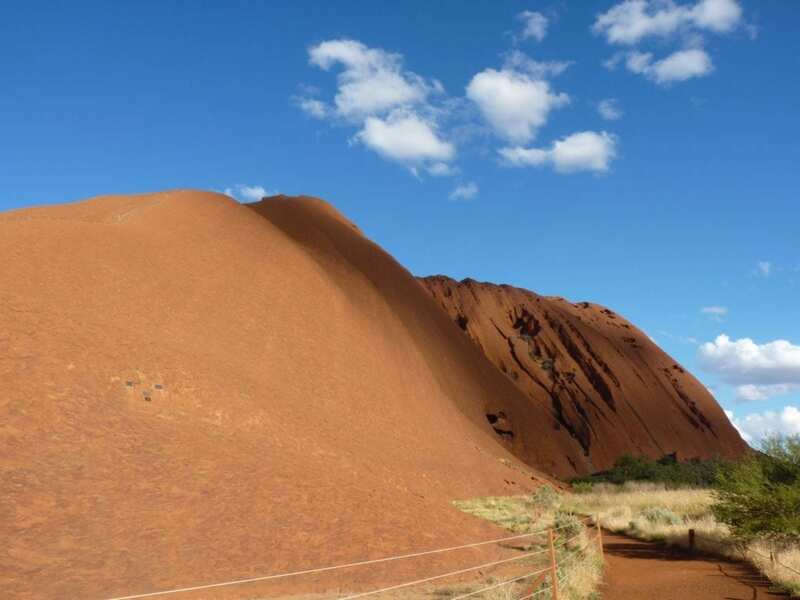 The rock which is now Uluru was compressed even more and rolled onto its side. The extreme compressive forces made this rock harder than the surrounding rocks. The softer surrounding rocks eroded over time, exposing Uluru. Over millions of years, wind and rain knocked off all the sharp edges to give Uluru the smooth appearance you see today. So you’re effectively looking at a giant rock standing on its end, with most of it buried. 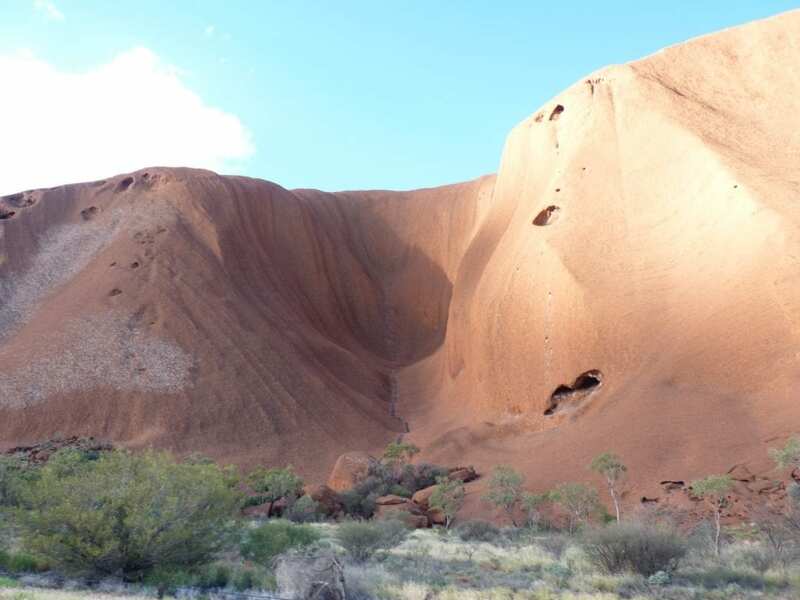 Today, Uluru is 350m above the surrounding plains and has a circumference of about 10km. This really is a rather large chunk of rock! By the way, Kata Tjuta followed the same formation process. However the original sediment was comprised of many layers of rocks and stones laid down by an ancient river. This is why Kata Tjuta has millions of chunks of rock embedded in its structure. 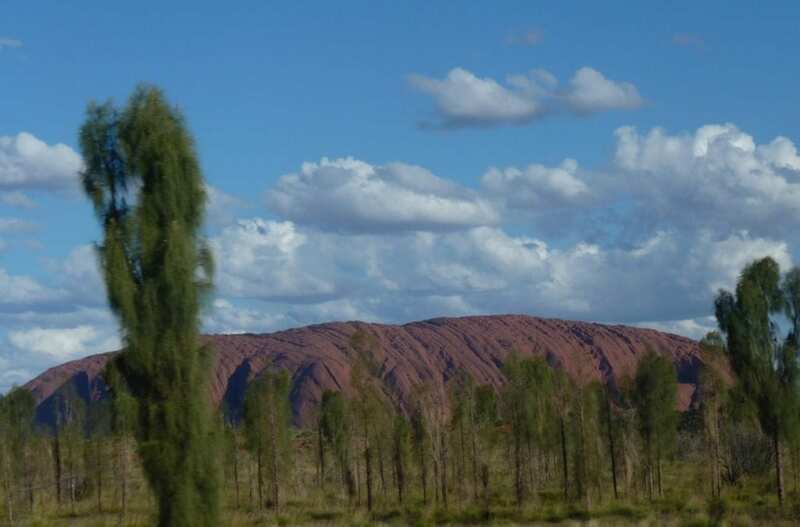 What Is Uluru To The Anangu People? In our article on Kata Tjuta, we introduced you to the concept of Tjukurpa. This is all-encompassing, giving the Anangu people a moral compass, their reason for being, and the how and why of their connection to country. Tjukurpa is incredibly complex and I don’t pretend to understand even a fraction of it. Within Tjukurpa are stories of creation beings… ancestral beings who travelled across Country and created it. Their journeys are called songlines, often traversing hundreds of kilometres. Most importantly, these ancestral beings are still here today living in or on Country. Few white people understand this. Our white concept of past, present and future does not apply. 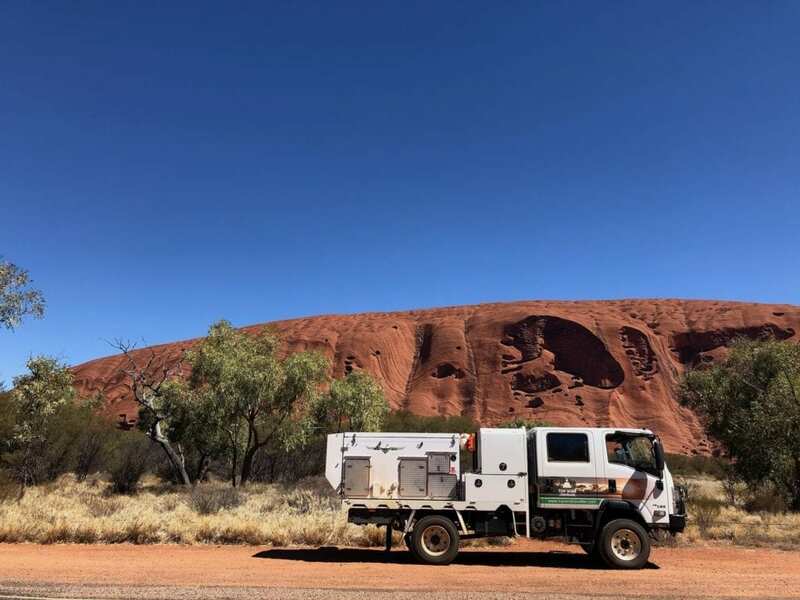 The best way to get an inkling of the Anangu’s connection to Country is to visit the Cultural Centre. Then take a few walks and see Tjukuritja, the physical evidence of the creation beings who are here in this land. Suffice to say, Uluru is incredibly important to the Anangu people. Their Country is a living, breathing entity. They have a responsibility, an obligation to look after it for their people, their ancestors and their creation beings. 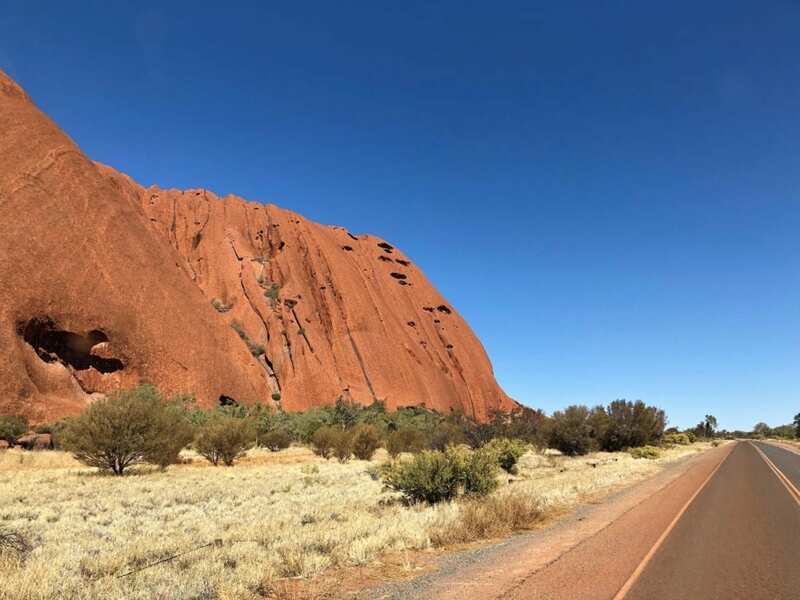 For a glimpse into the Anangu’s perspective and a whole lot more, Parks Australia have loads of excellent information about Uluru-Kata Tjuta National Park here. We visited Uluru in 2006, 2010 and again in 2018. What is Uluru to us? Simple. Uluru is alive, it has soul, a raw power, a feel that’s impossible to describe. For us, there are two parts to Uluru. The first is when you catch a glimpse of it way in the distance, across the desert plains. It’s faint and smudged yet unmistakable. Uluru first appears as a smudge on the horizon. Then as you get closer it comes into focus, growing before your eyes. Before long, Uluru is towering over you… so big that it doesn’t seem real. Your senses are overwhelmed at this massive rock in the middle of a desert. By this point, you get the sense that it’s pretty big! Even after three visits, we still get the same awe-struck feeling. Uluru exudes power and authority. The second part of Uluru is the detail. 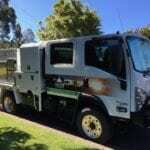 Get out of your vehicle and walk. It’s the only way to immerse yourself in the beauty of this place. Up close, you begin to see the detail… the polished surface of Uluru, the tiny pockets of green hidden away in protected places, the culturally significant sites. With a circumference of almost 10km, you can fairly easily find a spot away from the crowds. You’ll get so much more from your visit if you spend some time walking around. If you don’t feel slightly changed after a visit here, I’d be very surprised. As for the long line of people we saw climbing the rock. Well, to us they’re missing the point. 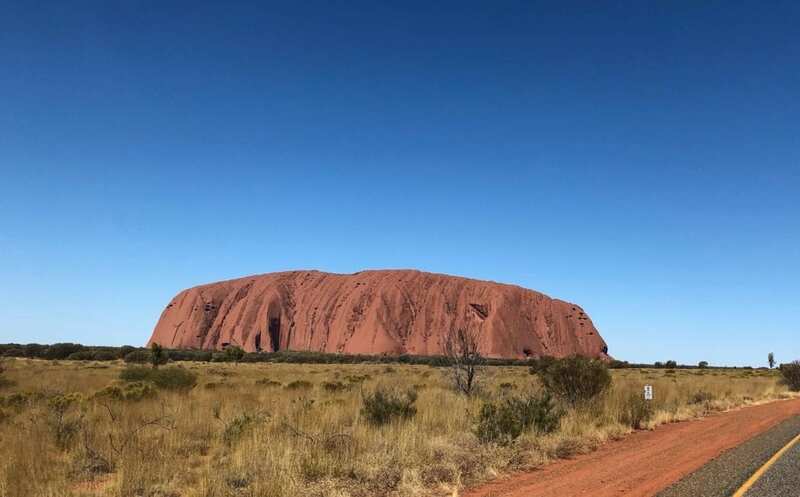 It almost seems like they’ve travelled many thousands of kilometres from all parts of the globe, only to miss the best part of Uluru. It’s such a shame they’ve travelled so far, yet are blissfully unaware or uncaring about 30,000 years of accumulated knowledge. If you look closely you’ll see the climbing path up the ridge to the left. In the foreground are plaques remembering the people who have fallen off and died. 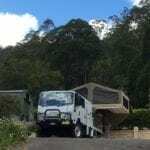 And for Australians who visit the rock just to climb it and then be on their way… well I wonder what they’re afraid of. I wonder why they’re so determined not to acknowledge the Anangu people’s incredibly complex culture and knowledge of Country. They don’t know what they’re missing out on. Uluru is so much more than a giant rock in the desert. It grabs your attention and draws you in. Get out of your vehicle and start walking. Find a spot away from the crowds and take the time to marvel at its beauty. We found a quiet spot to pull up, have lunch and take in the magnificent view. Picture in your mind how his place was before white man. Marvel at the Anangu people’s knowledge of this Country and how they learnt to thrive in what to us appears to be a forbidding landscape. Get to know and feel this place. Most of all, respect Uluru and the people who have looked after it for 30,000 years. 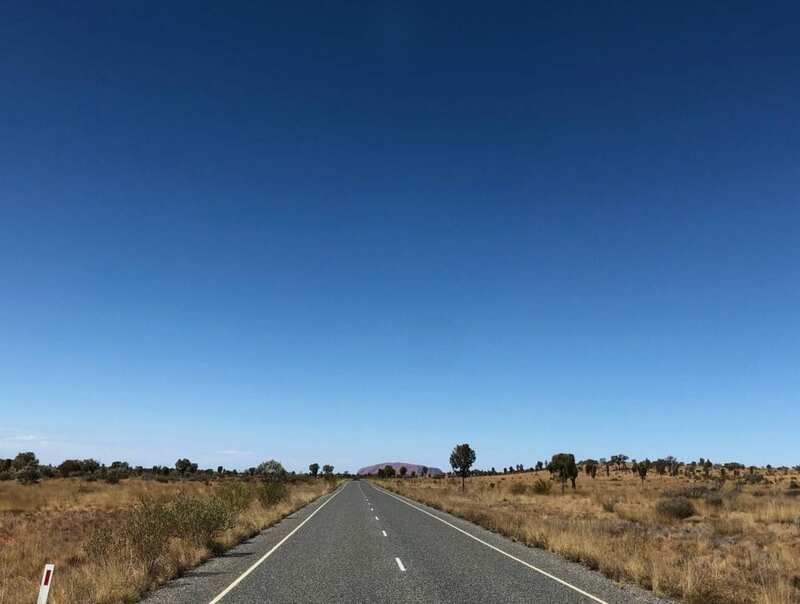 If you’re looking for ideas on tours or places to stay at Kata Tjuta and Uluru, TourRadar have a good selection. Uluru is on Anangu Country. 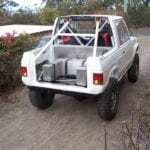 For more articles on The Outback Way, go here. 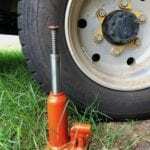 What To Do When Your Bottle Jack Is Too Short? A Simple Alternative. Success! 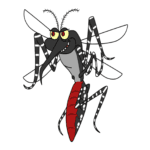 Our Long Search For The Best Mosquito Repellant Is Over!